Tropical storms: Hurricanes, tornadoes etc. 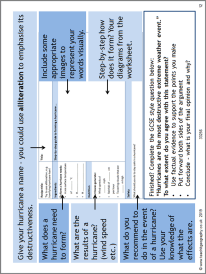 A resource guiding students through the basic formation of a hurricane. Students take notes on the formation of a hurricane and then complete a writing tasks, explaining the characteristics of a hurricane by creating a recipe. An assessment grid is included, which could be completed by the teacher, peer or student themselves. See other resources: Tropical storms: Hurricanes, tornadoes etc.